Exclusive! 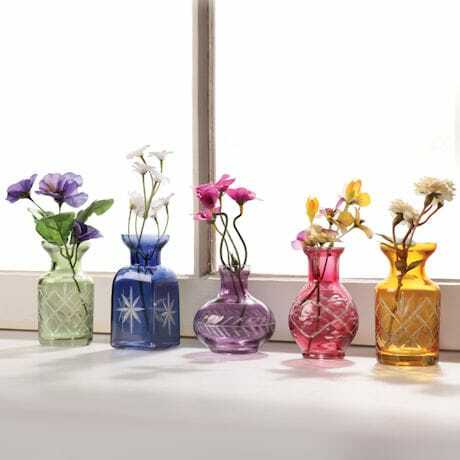 Five little vases, five shapes, five colors. The engraved designs suggest fine crystal. 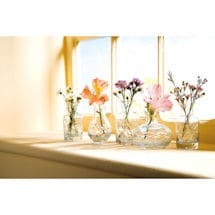 Line them up on a windowsill to glow in the sun, create a flower-filled centerpiece for your table, use them as individual place settings, or scatter them around your home. Sizes range from 2 ¾"-3 ¾" high. Set of all 5 (HX3087): green, blue, purple, red, yellow. Clear Glass Set also available (PT2104 - sold separately). Hand wash.